It has recently been revealed that if RARE had not been sold to Microsoft and remained Nintendo exclusive, many of the key people at the company would have stayed which makes one wonder what could have been. 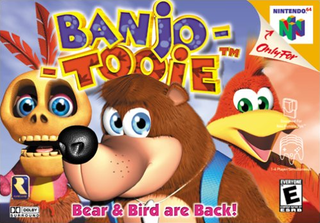 It turns out that some of those former RARE developers are testing the waters to see if they could create a "spiritual successor" to Banjo-Tooie. This group has joined forces under the Twitter name Mingy Jongo and they are starting their project by simply measuring fan interest through Twitter followers. I would not be surprised to see a Kickstarter campaign to pop up to really kick things in gear if they see the Twitter support. No platforms have been listed outside of possible use of the Unity engine but my best guess would be a downloadable version across all major home consoles including Wii U since Nintendo just licensed Unity for Wii U development. Show your support and follow Mingy Jongo on Twitter Now!